Croup (also known as acute laryngotracheobronchitis) is a viral illness that is easy to recognize -- when you know what to look for. Learn more about it, below. Children with croup usually wake up in the middle of the night with a loud cough that sounds like a barking seal. Other croup symptoms might include a fever, a hoarse voice, and a runny nose. In more severe cases, children will also have stridor, which the American Academy of Pediatrics describes as a "coarse, musical sound each time that he breathes in." If a child with croup has stridor while he or she is quiet and sleeping or resting, that is usually a sign that he or she is having a lot of trouble breathing and you should seek medical attention right away. These croup symptoms are caused by swelling and mucus buildup below the child's vocal cords. There is no type of testing that is currently available for croup. Diagnosis is usually made once the typical barking cough is heard. Although it's usually not necessary, a lateral (side) neck x-ray might show a "steeple sign." A steeple sign means that the upper part of the trachea is tapering. The usual first croup treatment is to take your child into the bathroom, close the door, sit on top of the closed toilet seat together, and turn on a hot shower (don't leave your child unattended around hot water). Don't touch the water, but breathe in the humid air together. As the room gets steamy, it should help to relieve your child's symptoms. Other treatments may include a pain and fever reducer, cough suppressants (although they will likely not be helpful), and a cool mist humidifier. Always ask your child's doctor before administering any type of medication. If those types of treatments aren't helping and your child is still having trouble breathing, seek medical attention. If necessary, your pediatrician might prescribe oxygen, special breathing treatments (racemic epinephrine), and/or steroids. Stridor is often confused for wheezing. Although croup is a mild infection in most children, it can be severe and even life-threatening. If your child has a barking cough and seems like he or she is having trouble breathing, call your doctor or seek immediate medical attention. 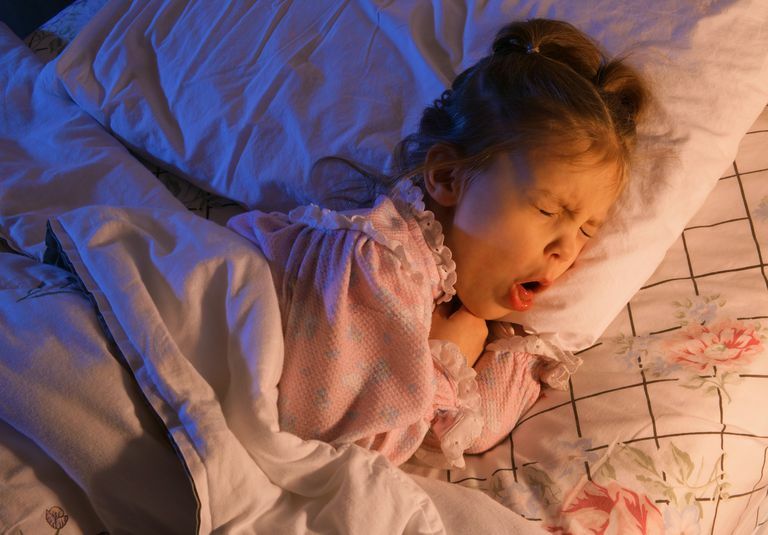 The first night of croup symptoms is usually the worst. After a few days, croup symptoms begin to resemble a regular cold, with a runny nose and a more normal-sounding cough. Symptoms might be better during the day, only to return the next night, so even if your child is much better after a night of croup symptoms, you should still call your pediatrician. Older children and adults usually just get colds when they are exposed to a child with croup. Since more than one virus can cause croup, your child might get it more than once. Croup is most commonly caused by the parainfluenza virus type I, but other subtypes of parainfluenza, adenovirus, RSV, and influenza can also cause croup. If your child gets croup a lot or continues to get croup after age six, you might want to take him or her to an ENT (ear, nose, throat) specialist (also known as an otolaryngologist). Allergies or reflux might also trigger spasmodic croup, which is similar to viral croup, except there is no fever and children have a quicker recovery. Radiopaedia. Steeple sign (trachea). http://radiopaedia.org/articles/steeple-sign.